I saw this thread and decided I should join all of you. I have so many squares from the birthday swap that this is a nice way to use some of them. I have 10 stacks of 10 done, just need to go buy some more quart bags and I'll be ready to mail. Here's a peak for you to see. Honchey, sent all of my info to you. Thanks for hosting. We have an update of swappers: Welocome Jaba, I pm'd my info to you. Please remember that there should be no repeat of scrappy squares in the 10 blocks in one quart size bag..
All of you are on the ball as far as making the blocks.. If we all get done ahead of time I'll be able swap them out sooner. Okay? Also please remember to label each baggie with your Quiltingboard name as well as the gallon size bag that will hold all the baggies.. Your name and address on the gallon bag will also help in the swapping of them. Don't forget to include your return postage, no stamps please. Well, I have finished my 3 sets of 9-patch. Loved every minute of sewing the blocks-it was so fun. Now-do you let us know when to mail? I am going to have to go over the rules again to see how to mail them. Do we just send cash in the padded envelope? Sorry, I have not done a swap before and hope to do this right. I'm almost done with my blocks. I have 6 more to go, trim them all and I will have 10 sets of 10 done. I would put the concealed cash in an envelope addressed to me between the blocks of one of the baggies. I think that's the best way to do it.. Make sure to pm me the tracking number so I can check to make sure it's where it should be and not lost in La La land. I'm so jealous of those that have them done already. I was busy cutting yesterday and today is the second day I'll be packing the car.. DH & I will be up very early tomorrow to be on our way. I won't be able to sew until Saturday. Any questions will have to wait until Thursday. I will be incommunicado tomorrow. I want to thank all of you for joining this swap.. It is my first and I would like to do another in the future several months after the close of this one. hopefully I'll see all of you again. I'm thinking of a Christmas/Holiday theme with 5 med - dark scrappies with 4 light neutrals. what do you think? Have a safe and fun trip. I think the Christmas/Holiday theme swap would be fun. I had so much fun doing this one that I am ready for another one to start-but after we all receive our goodies that are swapped on this 9-patch. You are great to do this swap and greatly appreciated for all of your work. The Farmers Wife Quiltalong, The Pony Club Quiltalong and The 30"s Quiltalong. There's lots of Christmas fabric on sale all over right now. We have another swapper!!! Welcome Sunrise!!! I unpacked the car yesterday, went food shopping and was in bed by 9 last nite… My sewing group is celebrating a birthday today and we are all going out for lunch. When I come home I'll have to start putting away all the "stuff" I traveled with.. then I'll be back in the groove. Have a good day all of you and do what you like to do!! I am thrilled to be part of this swap! I have 5 sets and going on. I am trying to make it to 10 sets. Honchey, I am sending you a PM. Thanks for letting me be a part of this swap! I'll be sewing on Sunday.. It's Pizza day for us so I'll be free to do what I want all day!! Anyone wanting to send in their baggies you can do it now. Thanks Honchey, mine are ready to go and will be in the mail first thing next week! Put my package of ten groups of nine-patches in the mail this morning. Expected delivery is Monday, February 4, by 8:00 p.m. Hope the Post Office is right on this one. I had a great time putting the blocks together. Only had to redo a few of them because of the seam allowances. I think I finally got it right. I'm really looking forward to receiving the blocks from other participants. I'm already cutting 6 1/2" blocks to put between them to make an Irish Chain top. Sigh! My scrap box is still full, even after cutting so many little squares! One of these days, I'll figure out how to do a quilt top without having so many scraps, right? Don't you know that when you put the candies away they have fun and multiply.. I still can't figure out when I put them in the drawer I keep on finding more than what I put away!!!! YD, you need to PM the tracking number to me. I can't wait to see them! Honchey I made all of my blocks. Now I'm going through them all and I finding a lot of them are not 6.5". Most of them are 1/16th short. I will be lucky if I have 5 sets. At this point in time I'm not sure if I will be making more 9 patches. I am getting frustrated with making these blocks. I know I cut all my squares correctly. I measured each square at least 3 times. I sewed with less than a 1/4" seam and my blocks are still coming up short. I have no idea what I am doing wrong. I know I said I would do 10 sets. Would you be okay with 5. I will try to make more blocks if I don't get to frustrated with the ones I have know. 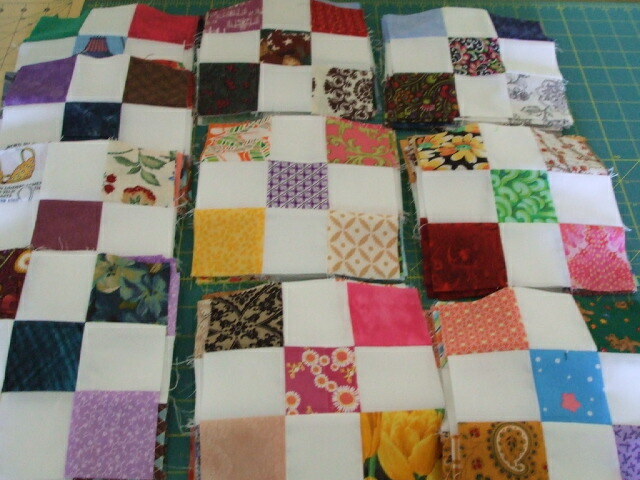 Queenbarbiej-Please don't get frustrated with making the 9 patch blocks as I had a few that were not 6 1/2" square too. I just put those blocks in a place not to be used and I recut scraps and cut the new 2 1/2" scraps just a shade (like 2-3 threads larger). Also, when I iron the blocks I had to remember to just "up and down pressing" not like I was ironing a blouse or something like that. This is for fun so good luck and please just enjoy the swap. QB, Don't get frustrated! I have found that using a finer but still 50 wt thread is the key for me..My first go round I had the same problem as you.. I still use C&C thread but find it's fatter than let's say other brands. I won't use it when I need to be more precise. Another factor could be the weight of the fabric. Smoother fabric will lay flatter than fabric that has a courser feel to it. I sew 2 pieces together, fingernail press then measure to see if its 3.5 inches I do this to every section.. It takes me longer but at least I know at that point whether or not to rip the seam out and do it over after making adjustments either with the machine or my handling of the fabric as it sews..I can't sew a straight seam without a guide on the presserfoot.. my seams tend to be short on one side because of the way I hold the fabric then I have to go over the seam to make it straight. Whatever you want to send is fine by me.. there is more than 2 weeks to get done and sent to me.. I still have a ton to make..I haven't been feeling well the last 2 days with a very sore throat and aching body.. I was supposed to be sewing today and I'm still in my PJ's. Thanks for everyone's help and opinions. I will keep trying. So far out of all of the 92 I've done, I was able to use about 35 of them. At last they weren't a total lost. I will use the rest of them in my quilt. QB, don't give up! I'm not participating in this swap, but have been in the last 3 that sewbizgirl sponsored. I have made about 200 nine patches for those swaps and had much better luck when I sewed long 2-1/2" strips together and then cut them into 2-1/2 pieces. It is much harder to get perfect 6-1/2" squares if you're sewing individual 2-1/2" pieces together. I tried the small pieces for several of the nine patches and had absolutely no luck doing it that way. I keep finding beautiful patterns for scrappy nine patch quilts so you will have a lot of choices to use them. Don't get discouraged - you'll be amazed at how pretty the quilts turn out. I have made three so far out of my patches and am happy with all of them. They are all quilted and just need the binding on them. I'll keep following this thread to see some pics of everyone's finished quilts. Hi Everyone, I received the first squishy today from Youngduncan. I am so tempted to open them but I'm going to wait until I feel better... I don't want to misplace any of them. Thank You YD for the extra. I'll send my DH to Starbucks for hot chocolate! Last edited by Honchey; 02-04-2019 at 05:00 PM. I have 3 sets cut but I have to pull out of the swap. I just received news that I have cousins coming for 3 weeks. I haven't seen family for 5 years since I went home and buried my mother. But I will be watching in the future to join. Have a great swap! !